And he really should stand down as treasurer till he is investigated and Mathias Cormann announce the Budget, in his comic Schwarzenegger accent, in his place. for years now. 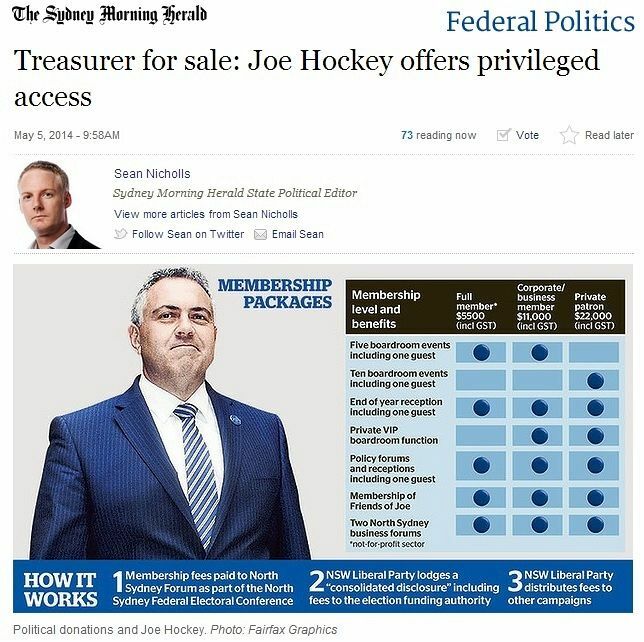 One has only to think of Abbott’s personally administered slush fund ‘Australians For Honest Politics’ which was used to gaol, wrongly, Pauline Hanson and David Ettridge and to slander, lethally, Cheryl Kernot, to realise how many legs this influential centipede has walked on down the years since Robert Askin opened his gambling den, the Forbes Club, and NSW police kept Four Corners, at gunpoint, out of it. There is no reason to suspect this method of dealing (so celebrated in Rake) ever ceased. the gambling licences, and the development permissions, James Packer so smoothly achieved in Darling Harbour. 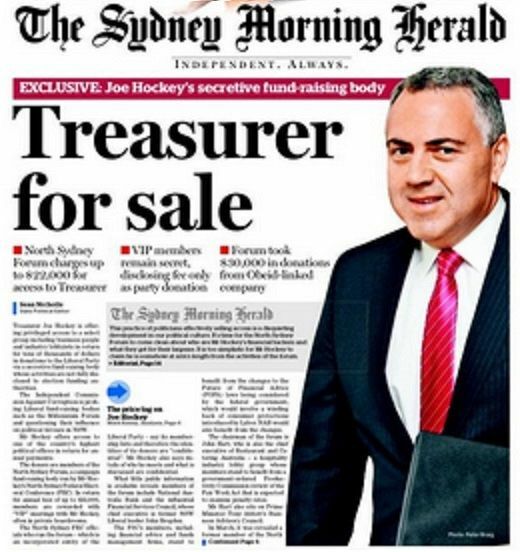 There was the $20 million Assistant Treasurer Arthur Sinodinos was to get for securing former NSW Premier Barry O’Farrell’s signature, if he could, on a $500 million dollar contract to sluice sewage smoothly to some new-built western suburbs. he, himself, would have accepted the now notorious Grange and, moreover, drunk it. He said this a fortnight ago, which shows how accepted, how smugly boasted, how self-righteously embraced and how long-standing it is. so riddled with dishonest process, and dishonoured vows. It is equally hard to imagine what they would say in response.